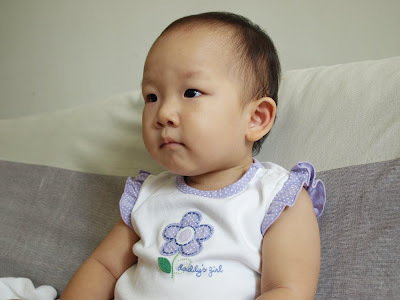 In the mornings, Natalie is happy to be awake and, usually after a bottle, will run around, mess up her toys, climb on the sofa, and shout encouragement for us to play with her. Below are some photos from this morning. To cut Natalie's nails, I turn on the TV briefly (on the baby TV channel). Here she is totally stoned and mesmerized by the sounds and colors on the screen. When I finally turn the TV off, Natalie grabs her little friend and presses her belly button over and over again (the doll makes gurgling and laughing noises you press her belly button). 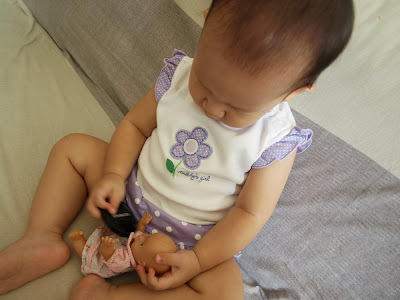 Then Natalie tries to feed her baby doll the lens cap. Mmm... yummy! 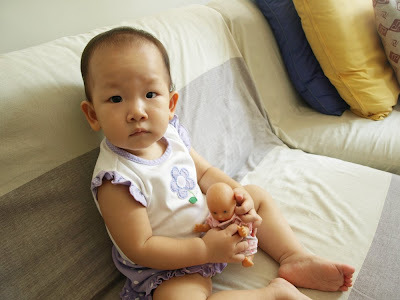 Then she protects her baby doll from being taken away by her mommy. I just want to look, can't I just look? 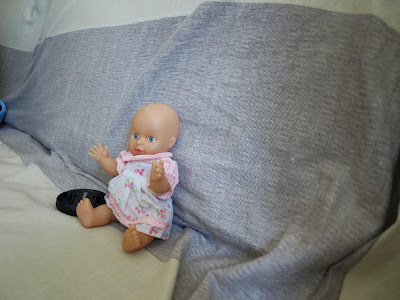 After a few minutes, Natalie gets bored, dumps her doll and the lens cap on the sofa and moves on.